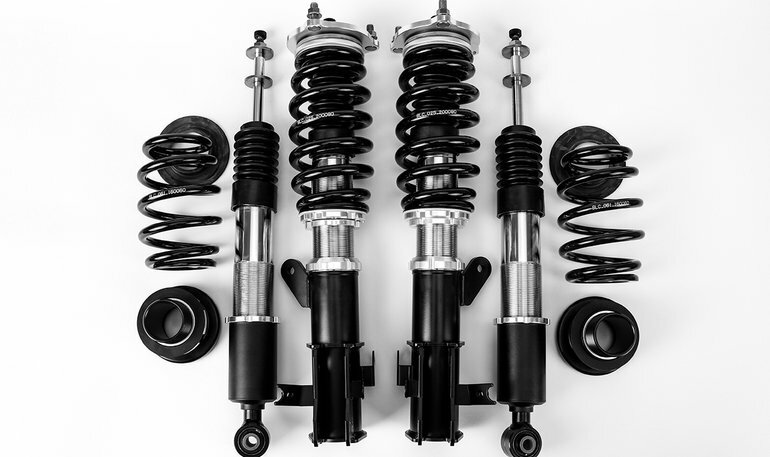 Because the words “shocks and struts” are most often said in the sentence, or sometimes even used interchangeably, many people are unaware of the difference in the two parts. A shock and a strut do the same basic job on a vehicle, preventing a vehicle from bouncing, but they are completely different parts. A vehicle will have either a shock or a strut at each wheel, not both. Every vehicle was designed with either shocks or struts and your vehicle's suspension cannot be changed to use the other. A shock absorber only keeps the car from bouncing. Struts are quite different. Struts are the main component of a modern independent suspension system – they “suspend” the body and frame of your vehicle above the wheels. The struts transfer all the weight of your vehicle, via several other components, to the wheels. The weight of your vehicle is suspended above the wheels by use of a spring, which allows for travel without bouncing with every crack, bump, or pothole in the road. With just the spring, however, the vehicle would still move up and down several times after each bump. Think of someone jumping on a trampoline – after the initial jump, it takes a couple ups and downs to come to a standstill; the same principle applies to vehicles. To minimize this, vehicles use shock absorbers. Shocks are exactly what their name claims – they absorb the shock of an uneven road before it reaches the body of the vehicle. The result? No trampoline-like experience. Struts need to be replaced if any of its components wear out. Although you may not think to replace them as often as you would other items such as filters, brakes, or spark plugs, they are not made to last forever. As the shock’s ability to resist movement lessens, it becomes difficult to control your vehicle. Additionally, when this happens, every attached part feels the impact those components wears more quickly. The suspension springs, support arms, bushings, joints and wheel alignment all take a beating. If you notice any of the following conditions, it’s time to come into Bartow Ford and have our friendly technicians check your shocks or struts out. Good shocks allow a stopping distance of a least 104.8 feet, but worn shocks could require at least 117 feet to come to a complete stop. When you apply the brakes, the tires begin stopping but the vehicle inertia tries to keep going forward. This imbalance puts stress on the front brakes and reduces the rear brake’s efficiency. During cornering, the vehicle weight tries to lift and roll toward the outside of the turn. When the ride is rough, harsh, or noisy, it impacts driver comfort and tire performance. During initial acceleration, the front end rises and the back end lowers. When the tires can’t grip the road, for any reason at all, the result is loss of control. When the tire seems to over-react and move upward too aggressively, this is an indication that either the vehicle is being over-loaded, driven too harshly, or that the shocks are worn. Excessive left to right or sideways movements from wind gusts, road conditions, and steering movements. When the tire moves up & down excessively, an evenly-spaced wear pattern begins. Unlike tire balance conditions, the wear pattern frequency is greater from shorter tire movements. As the condition worsens, tire noise occurs along with traction loss and tire damage. Experiencing any of these symptoms? Call for your appointment at Bartow Ford today. We’ll make your ride smooth again! And don’t forget about our $58.95 Diesel Oil Change! 863-533-0425.